I met Jesus at the age of four. In my memory it happened like this: I’m laying on my back, the faded rose and ivy comforter of my parent’s four-post bed beneath me, and my head is dangling off the edge. Charlie is there, just a few years older than I but already my idol. And my recently born-again Mom. She is glowing, and talking fast, giddy but sane as day. She tells me about this Jesus, this Jesus who I can talk to, this Jesus who already talks to her. I do not know her exact words. But I know that if she loves him, I can, too. One year later my brother is walking down the aisle of Our Lady of Humility Catholic Church dressed in a white suit, arms linked with his seven-year-old bride. This is his first communion and I do not know why I can’t join him in the feast of Christ’s body. “I know him. I love him. Why can’t I eat him, yet?” My mother listens and she loves. I am now seated around a laminate wooden table in the head mistresses’s office. She is quizzing me, testing my profession. Do I really know Jesus? Do I really know what I’m doing with him? Do I know what he’s done for me? Yes. Yes. Yes. I am loving him. And I know he was loving me when that body was broken and the blood poured out. I know this because my mother told me so. If she can believe in Jesus, I can, too. I am dressed in white, receiving my first communion at age five, because I believe the right things. My mother believes Jesus lives in me. I want to hear him talk to me like she does, casual. If Mom can hear from Jesus, I can, too. He starts speaking to me. I don’t remember what he says to a five-year-old child bride. But he isn’t my father. And he isn’t my husband. He sounds more like my mother. Mostly me and Jesus ride bikes, throw the baton, and call in requests to the oldies station. My parents divorce when I am in middle school and I develop separation anxiety. I tell my mother that I am going to marry her when I grow up. I tell her I love her more than God. We map out our images of God in the faces of those we love. In her essay in Women, Writing, Theology: Transforming a Tradition of Exclusion (Baylor University Press, 2011), Meghan Sweeney shows how 20th- century martyr Edith Stein made sense of her life through the lens of the saints. By creatively re-telling the stories of Esther, Theresa of Avila, and others, she wrote hagiographies as a way of understanding her own beliefs and how they took shape in the lives of women who came before her. This is the way of discipleship, becoming imitators of imitators of Christ until we can see the God among us, the God with us, the God within. I had never seen this icon before. Thank you for sharing. Me neither! 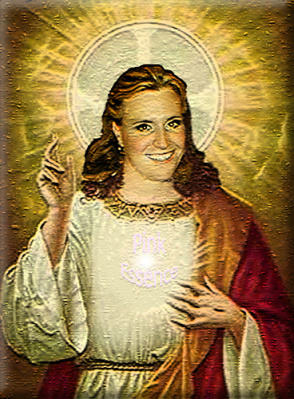 Here’s the link where I found it; I should have given credit: http://whyevolutionistrue.files.wordpress.com/2012/03/female-jesus.jpg. Oh, Erin, what exquisite, humbling inspiration (as a mom, as a person of faith, as a writer).